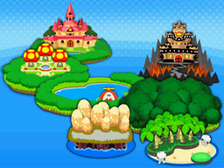 Bowser Path is a road which leads to Bowser's Castle in Mario & Luigi: Bowser's Inside Story. It can be accessed by traveling northeast of Bumpsy Plains. The area contains many conveyor belts and requires the use of the sliding punch. Bowser saved his Shy Guy minions on Bowser Path and learned the Special Attack Shy Guy Squad. There are 10 Beans that can be unearthed on Bowser Path. The road ends in Bowser's treasure vault, located under his castle, which is where Bowser encounters the Fawful Express. 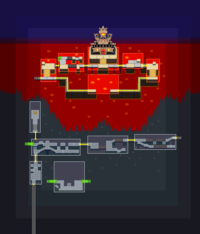 This is also the last area where the Bros go to the Arm Center. Here is a list of overworld items found in Bowser Path in Mario & Luigi: Bowser's Inside Story. Power Band In a brick in the southeastern corner of the third scene from start. Max Nut In a ? Block in the underground shortcut to Bowser Castle. In a ? Block inside one of the holes on Bowser Castle (the player needs to have Bowser burn the poster first). POW Mush Jam In a ? Block one scene to the left of Bowser Castle. Giant Shell In a ? Block inside one of the holes on Bowser Castle (the player needs to have Bowser burn the poster first). There are 10 Beans in total. The music played on Bowser Path is the same as the music played in the Underground Tunnel, Toad Town Caves and Tower of Yikk. This page was last edited on January 26, 2019, at 18:38.